Our client was struggling to find a content and SEO agency that would support him with content for link acquisition due to concerns about his specialism. Given the name of his website (aretheyonsteroids.com) other agencies would not take him on believing it to be an immediate red flag to journalists – Move in JBH! Our client had a wealth of knowledge and discusses all kinds of health, fitness and bodybuilding related topics on his site. This gave us an opportunity to sell him as an influencer and expert to journalists. We looked at topics in the fitness industry that were trending on social – specifically the use of the trending hashtag #GirlsThatLift. Through the hashtag, we discovered many female bodybuilders all over the world who were influential on Instagram. Many of these influencers had used weightlifting and bodybuilding to overcome personal issues, which ranged from anorexia to depression and alcoholism and this gave us the perfect hook for the campaign and enabled us to target a variety of journalists and publication types from fitness and bodybuilding to lifestyle, top-tier news and womens titles. 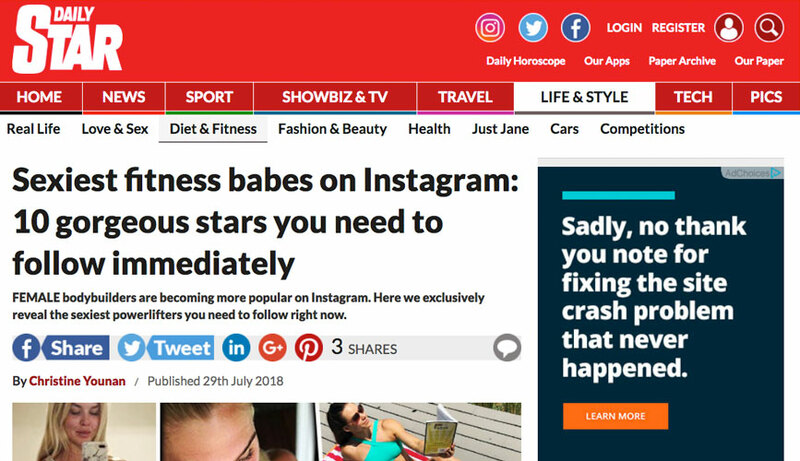 For the campaign we created a listicle of global female bodybuilders, pitching the content to journalists giving them a compelling piece of content that had comparisons, pop culture and a strong emotional hook. In order to present our client and the website in the best light, we offered journalists bespoke quotes from our client on fitness and nutrition. This immediately signalled to journalists that the client was an expert and could offer them a unique story, backed by expertise and knowledge.